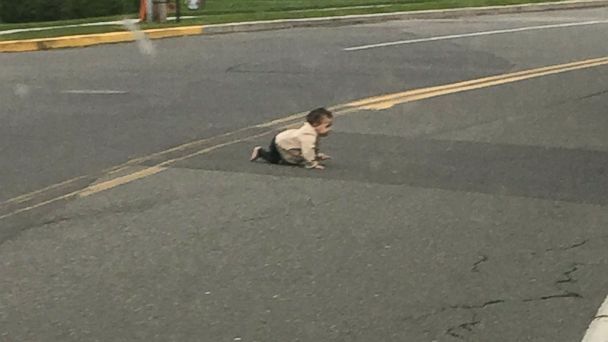 A week after a passerby's photo of a toddler crawling in the street went viral a New Jersey man has been arrested and charged with neglect. Evgeniy Dorman, 41, surrendered to police in Lakewood, New Jersey, on Friday afternoon, according to New York ABC station WABC. He was released pending a future court appearance. A driver pulled over and snapped a photo of Dorman's 10-month-old son on Sept. 22. The driver, Cory Cannon, was on his way to work when he saw an infant crawling across Joe Parker Road just before 6 p.m. on Saturday in Lakewood. "I thought, 'It's a bag or a toy,'" Cannon told ABC News, recalling the incident. "I started to slow my truck down, so I could slow the traffic behind me, just in case it was something that could have done damage to the car, let alone it being a child," he told WABC. "When I saw the child move, that's when I moved in to block off traffic and get myself out of the middle of the street. And then I snapped the pictures as I was getting out of the truck."